The ethos is relaxed luxury, peace and tranquility, enhanced by our friendly and professional service. They only a few minutes drive away from pristine beaches of Plettenberg Bay, a large selection of activities and award winning golf courses. They offer fine dining, as well as delicious breakfasts. The organic herb and vegetable gardens supply the kitchen, and self-catering guests are welcome to pick their own salads. The swimming pool is private and has the most amazing views. 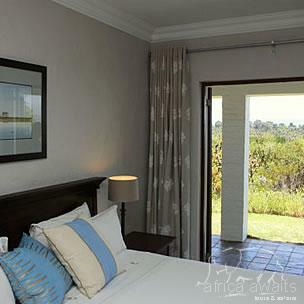 At Fynbos Ridge you can choose between bed and breakfast accommodation in the Country House, or self-catering in the garden cottages and studio apartment. 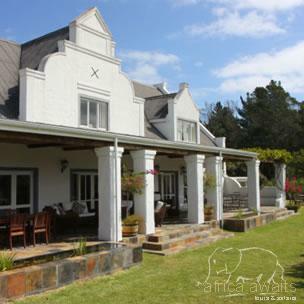 Country House: The Country House is a large Cape Dutch design guesthouse which has 4 double luxury bedrooms and 1 double superior luxury bedroom - each with full en-suite bathroom. Full breakfasts and dinners by arrangement are served in the alfresco dining room. Both the formal and informal lounges have log fireplaces and there is a long outdoor patio where guests can enjoy mountain views whilst having their breakfasts and dinners. 3 two-bedroom cottages. Each spacious cottage (140 sq. metres) is well equipped, has two bathrooms, and sleeps up to 5 people in luxury and comfort. Apart from the tasteful furnishings, there are log fires in the lounge and main bedroom for the cooler evenings, as well as a private patio with a built-in barbecue. The cottages and the studio/apartment are all named after one of our beautiful indigenous flowers. Although our cottages are fully equipped for self-catering, breakfasts and dinners are available by arrangement in our Country House. Meals can also be supplied to the cottages. Delicious breakfasts served in the dining room of the Country House, or alfresco on the verandah. They offer a buffet of fruit, cereal, cheeses and meats, freshly baked croissants and scones as well as full English breakfasts made to order. In the evening, fine dining is available, made with the freshest locally sourced ingredients. Crunchy salads and sweet young vegetables, freshly picked from the organic herb and vegetable gardens. All accompanied by home made bread, straight from the oven. Self taught chef Brian, has been awarded many "Michelin Stars" by our guests, and the menu changes daily, depending on what is fresh and in season. 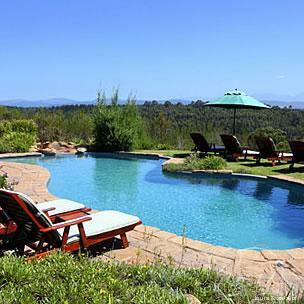 With your holiday, safari or business trip from in to Fynbos Ridge Country House in The Garden Route.